“Imagine the celebrated “Rider Deck” infused with the horrors of Night of the Living Dead, and the result is The Zombie Tarot—a crazy, campy interpretation of a classic divination system. A very accurate description, but it still doesn’t convey just how cool, clever and beautifully illustrated this tarot deck is. 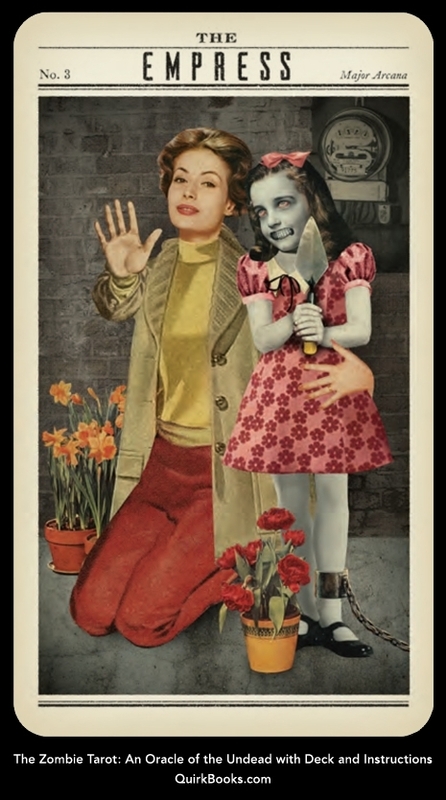 The artwork by Paul Kepple is whimsical, retro in style and chock full of in-jokes for the zombie aficionado, all the while still conveying the essence of the tried and true classic tarot suits and numbers. 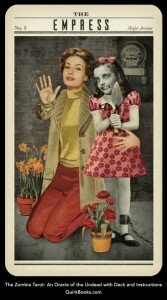 For instance, the Empress (which signifies a maternal, nurturing feminine force) depicts Helen Cooper from Night of the Living Dead with her daughter turned trowel-wielding matricidal ghoul. 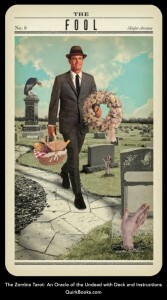 The Fool has a smiling man in a business suit carrying a funereal wreath and a basket, striding towards a gravestone and a hand thrusting out of the ground just waiting to trip him up. 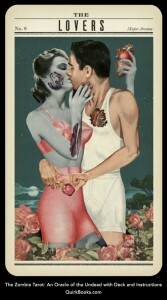 And the Lovers… well, take a look below. The text is equally clever, combining the classic interpretations with specifics to help the reader survive the zombocalypse or just the perils of every day life. The Empress, for instance, reads: A feminine force to be reckoned with, the Empress embodies birth, death and reanimation. Her maternal instincts kick into high gear whenever her offspring are threatened. She knows there’s no problems she can’t solve with patience, love, and a shovel to the back of the head. She is a nurturer, so her home is filled with both the living and the undead. Watch where you step. The Three of Swords, just for another example, starts out with: Oh no! Jealousy rears its ugly head–and in the wake of a zombie apocalypse, you don’t want anyone to take the phrase “Eat your heart out” literally. All of the text, from the rest of the card interpretations to the intro to the instructions are equally entertaining. The card layouts include: The Beginner, The Broken Heart, The Gravestone, The Severed Head, and the Eyeball. Did I mention I love this deck? The Zombie Tarot Deck shambles out onto the streets and for sale on June 5th and is available for pre-order on Amazon here! Don’t hesitate! It could save your life in the upcoming Zombocalypse!